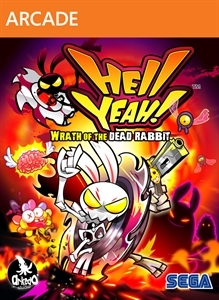 Check out the first gameplay trailer of Hell Yeah! Ash, the Dead Rabbit is really angry! Humiliated by a scandal, he is powered by vengeance and is on a quest to teach the monsters of Hell a good lesson. This trailer shows you some of the ways in which you can kill your enemies thanks to your jetpack driller and the hundreds of weapons you can get through the game. Hell Yeah! gives you full frontal violence in your face!